The Marines say the V-22 will prove the critics wrong. “Ask all the naysayers how many hours they have flown,” said Colonel Mulhern, the V-22 program manger. “They are just sitting around a desk and crunching numbers,” he added. Fans include General Castellaw, a Vietnam helicopter pilot, who has flown the V-22. “I came in at a high altitude and then did a tactical ingress,” said General Castellaw. “Yankin’ and bankin’ to avoid simulated fire, came in low, streaked into the zone. The aircraft is nimble, agile. You can yank and bank with the best of them. In DFW, we have an aerospace 'writer' named Bob Cox who is widely reviled by many of us in the local aerospace community as a complete shill for the Fort Woth Startlegram (Star Telegram) editorial meme-o'-the-day. I have never read ANYTHING this guy has written that fails to get at least one salient point either completely wrong or warped beyond recognition . I just found out today that he has a blog (hat tip Defensetech) , and today's piece doesn't disappoint in providing an example of the kind of vacuous articles he is locally infamous for. One of the key selling points of the V-22 Osprey, one that is repeated over and over by the Marines and the Bell Helicopter-Boeing contractor team, is that the aircraft can self deploy to combat. In other words, fly high and long distances to get from one base to a combat zone - say from the U.S. to Iraq - where it can there [sic] be put into tactical use on the battlefields. Well, for their first combat deployment with the V-22 to Iraq next month the Marines will be going by ship, Navy Times is reporting. First off, just because you CAN do something doesn’t mean you SHOULD do something now does it? As a second point Bob, let us remind you that V-22s are designed and qualified for ship-based operations as an integral part of their primary Concept of Operation (CONOPS). Are you put out that the Marines thought it more important to deploy via ship with their support equipment than fly half-way around the world for PR purposes? Surely the Marines had a reason to deploy this way didn’t they? In the next part of the article we find....Why yes! The Marines did have a good reason. Who’d a thunk? All along the Marines have viewed the V-22 as a dual role aircraft, able to operate from ships or land. But the self deployment capability is highlighted over and over and as a true revolutionary breakthrough, at least when compared to slower moving, lower flying helicopters. First, nice cherry-picking of only one (and not even the most important IMHO) of the revolutionary advantages the V-22's have over other vertical lift assets. Yes, the V-22 will be able to self-deploy, and yes it will be a major advantage when the V-22 is at or closer to Full Operating Capability (FOC). But the V-22 is barely past Initial Operating Capability (IOC) isn’t it? Since all major weapon systems go through this maturing process, and Bob IS an aerospace 'writer', one might assume Bob was aware of this fact. If he isn’t aware, that’s bad. If he is aware but chooses to ignore it and fails to relay his knowledge in his reporting in an effort to fit a template, well that’s despicable. What does Bob do next? Why, he speculates and assigns intent to prevent embarrassment as the motive of the Marines! Of course, the reliability record of the V-22 is such that the Marines probably don't want to take a chance on seeing several of the aircraft have to divert to landing spots along the way for repairs. The V-22s much ballyhooed trip to England last year for the Farnborough Air Show got even more attention when one plane diverted to Iceland due to engine troubles, later described as minor, and the return trip to the U.S. was delayed for other repairs. Of course Bob doesn’t acknowledge what is "probably" (he uses the word, so I get to also) the REAL driver behind the transport scheme. If my experience is any guide, the Marine’s main objective is to get their aircraft and unit into the area of operations intact and as quickly and efficiently as possible so they can execute their mission as quickly and efficiently as possible, take their lessons learned while performing their mission and make the V-22 and the Marines that operate them a better team and instrument of national power in the future. Visualize this Bob: The Mission--The Mission--The Mission. Bad press is a minor nit compared to unduly hampering the mission. And if Bob Cox and the Startlegram understood half of what they like to believe they do, and cared about their work one-tenth of what the military services do, they wouldn’t publish this tripe. Full disclosure: I attended Lawrence D. Bell High School, named after the founder of Bell Helicopter. My family had a dog named Huey (after the UH-1), my father was an engine rep on many aircraft including the proof of concept demonstrator for the modern tiltrotors, the XV-15, and I hate flying in pure helicopters because, among other things, half of your wings are going in the wrong direction at any given time. More Disclosure: I forgot! My unit also supported the V-22 program office by flying around some proof-of-concept CV-22 (AF SOF version) sensor technology on one of our itty bitty RPVs for a bit. It wasn't that memorable as I recall, just another Lincoln Labs or some such drive-by test program. They came, we flew, we got patches, and I think eventually one of our H-53 pilots got assigned to the JPO. James Taranto at Best of The Web Today does a nice little interleafing of John Kerry's defense and the point-by-point fisking of JK's rant by the WSJ's citizen-readers in response. "We heard that argument over and over again about the bloodbath that would engulf the entire Southeast Asia, and it didn't happen." “ John Kerry”, erstwhile Vietnam War veteran hit bottom with his assertions that a bloodbath in Southeast Asia after the US cut off the South Vietnamese at the knees in 1975 'didn't happen'. Mr. Kerry, who served in Vietnam before turning against that war, voted for the Iraq war before turning against it. He draws on the Vietnam experience in making the case that the outcome of a U.S. pullout from Iraq would not be that bad. "We heard that argument over and over again about the bloodbath that would engulf the entire Southeast Asia, and it didn't happen," he said recently. As seen at the page linked above, the Wall Street Journal (specifically James Taranto) "called out" the aging Junior Hairdo From Massachusetts on his shameful, self-serving statements. NOW, in an extremely weak retort, Kerry keeps digging and provides us with this gem, whereby he attempts to misrepresent the conditions in Southeast Asia both preceding AND following Congress’ shameful abandonment of the South Vietnamese in 1975 to fit his neat little left-wing POV. Does his delusional summary of the Vietnam War and its aftermath ring true with the American people? True science isn’t run on consensus, but political science is, so what’s the bottom line? Did Kerry make a sale with the WSJ public? A review of the reader responses posted so far gives me cause to think well of my fellow citizens. Out of 23 responses, 21 decidedly reject Kerry’s pseudo-intellectual posing, and most of those I would also say go so far as to properly MOCK the Senator and his ludicrous contortions. One response is rational but approaches the issue with oblique peanut butter spreading of recriminations among all players in his sight. Ehh, call it a 'Tie' ( = neutral). Finally, the lone (clear) Kerry supporter attempts to support his boy by also denying the Domino Effect via the technique of employing the narrowest possible definition of the Domino Theory and interpretation of the events that have followed, so allow the limited mind to ignore the instability of SEA after 1975. This supporter can be simply dismissed on the grounds that it is one of the WSJ’s perennial gadflies, a "semi-pro" commentator, who after retiring from a career as an ‘Educrat’ now spends his breakfasts crafting responses to any and all commentaries with which he is, or is not, in agreement. As regular readers are aware, one of my 'dreads' in this life is that we will be suffering more of such behavior in the future as more and more @# * #$^%@ hippies retire and have more time on their hands -- time to whine incessantly about all manner of things. Yes, “Michael D. McCaffrey of Yarmouthport, Massachusetts” I am talking about you and your ilk. Yowzaa! A Blast From my Past. Hadn’t seen one of these in decades....... until now. I was in one of the last 316X1L tech school classes to be trained on this piece of test equipment and the AIM 4F/G/WSEM missiles. We didn’t train on the missile shown, which looks like it could be an AIM-26B which was already obsolete in the US by my time, or it could be (from the looks of the dome and strakes) the Swedish license-built version, which was in service for years afterwards . The missile could even be the infeasible XGAR-11 (Experimental Guided Air Rocket) NUCLEAR version I’ve heard about but have never seen. After the schoolhouse, I never saw the station or a functional AIM-4 again, because I never got stationed at an Air Defense Command F-102 or F-106 base. But we missilemen all got tested on them yearly for promotion purposes. 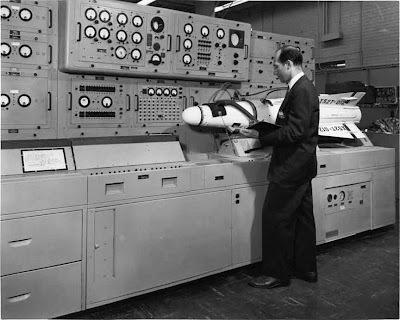 Until about the time I put on TSgt, around 40% of our Specialty Knowledge Test was on these few systems, even though only about 10% of the career field EVER got any hands-on experience with them….which sucked unless you were part of the 10%. Heck, this station AND the missiles had "tubes", and the WSEM had an internal recorder and strip charts among other things.